Attorney General Jeff Sessions Spoke With Russian Ambassador During Campaign : The Two-Way The tweets come after the AG said he won't take part in probes of links between the campaign and Russian officials. Sessions spoke with the ambassador but testified at a Senate hearing that he hadn't. Then-Sen. Jeff Sessions testifies on Jan. 10 at the confirmation hearing on his nomination as attorney general. President Trump tweeted a defense of Attorney General Jeff Sessions Thursday night, saying Sessions could have testified more accurately about his 2016 contacts with the Russian ambassador, but that any discrepancy was not intentional. Trump tweeted that the Democrats were creating a "witch hunt" to save face for having lost the presidential election. At a news conference Thursday, Sessions announced he would recuse himself from any investigations into Russian involvement in Trump's presidential campaign. The announcement came after revelations that Sessions spoke twice with Russia's ambassador to the United States last year. The attorney general defended his actions, saying, "I never had meetings with Russian operatives or Russian intermediaries about the Trump campaign." At the time, Sessions was an adviser to then-presidential candidate Donald Trump, a source familiar with the matter told NPR's Carrie Johnson. At his recent Senate confirmation hearing, when Sessions was asked about contact between the Trump campaign and Russia, he said he had not "had communications with the Russians." The apparent clash between the accounts prompted calls for Sessions to recuse himself from any inquiry into Russia's involvement in the U.S. presidential campaign — and, from some quarters, for him to resign his current post. Sen. Chuck Grassley, who chairs the Senate Judiciary Committee, released a statement calling the decision by Sessions to recuse himself "the right thing to do. "There's little doubt that alleged conflicts, no matter how flimsy and regardless of whether or not they are based in fact, will be used against him to discredit him and any potential investigation into alleged conversations between the campaign and the Russian government," Grassley wrote in the statement. Thursday morning, House Majority Leader Kevin McCarthy, R-Calif., had added his voice to those calling for Sessions to recuse himself, saying on MSNBC that the move would bolster public trust in the investigation's integrity. He also said Sessions needed to clarify the nature of the meetings. When journalists asked Trump about Sessions during the president's visit to the USS Gerald R. Ford in Newport News, Va., Thursday, Trump said he still had "total" confidence in Sessions. The president also said he "wasn't aware" Sessions had spoken to the Russian ambassador — and to a question about whether the attorney general should recuse himself, Trump replied, "I don't think so." Asked whether Sessions had told the truth to the Senate, Trump said, "I think he probably did." Responding to the reports, Sessions didn't deny the meetings took place; instead, he insisted on a distinction between his roles as a senator and as part of Trump's inner circle, saying in a brief statement issued by the Justice Department, "I never met with any Russian officials to discuss issues of the campaign." 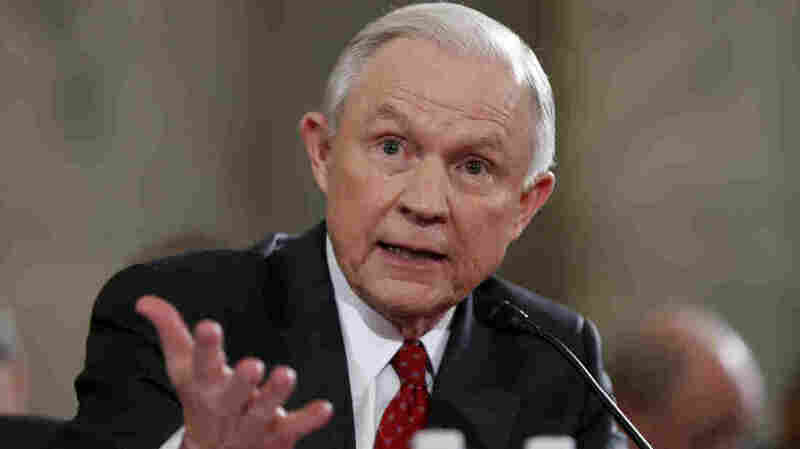 When he was up for confirmation by his colleagues in the Senate in January, Sessions was asked by Sen. Al Franken, D-Minn., what he would do as attorney general about claims that "anyone affiliated with the Trump campaign" was in contact with the Russian government last year. In his reply, Sessions said in part, "I have been called a surrogate at a time or two in that campaign and I did not have communications with the Russians." The Washington Post reported on Sessions' meetings with Russian Ambassador Sergey Kislyak late Wednesday, as did The Wall Street Journal. "One of the meetings was a private conversation between Sessions and Russian Ambassador Sergey Kislyak that took place in September in the senator's office, at the height of what U.S. intelligence officials say was a Russian cyber campaign to upend the U.S. presidential race." A person familiar with the matter told NPR's Carrie Johnson that on another occasion, after Sessions made a speech at the Heritage Foundation, he spoke with a small group of ambassadors including the Russian ambassador, that the group invited him to some events it was sponsoring, and that he made no commitments. The Journal said, "U.S. investigators have examined contacts [Sessions] had with Russian officials during the time he was advising Donald Trump's presidential campaign, according to people familiar with the matter." The paper said it was unclear what came out of the probe and whether it was still going on. "There was absolutely nothing misleading about his answer. Last year, the Senator had over 25 conversations with foreign ambassadors as a senior member of the Armed Services Committee, including the British, Korean, Japanese, Polish, Indian, Chinese, Canadian, Australian, German and Russian ambassadors. He was asked during the hearing about communications between Russia and the Trump campaign—not about meetings he took as a senator and a member of the Armed Services Committee." House Minority Leader Nancy Pelosi, D-Calif., tweeted a call for Sessions to resign Wednesday night. Also Wednesday night, South Carolina Sen. Lindsey Graham said that Sessions should recuse himself from the FBI's investigation — particularly when it comes to deciding whether to launch prosecutions. Reports of Sessions' meeting with Kislyak come weeks after President Trump's first national security adviser, Michael Flynn, resigned following disclosures of his discussions with the Russian ambassador that took place in December — before Trump and his staff were legally entitled to conduct foreign policy. Flynn said he left his post because he had "briefed the Vice President Elect and others with incomplete information" in not revealing he had spoken about U.S. sanctions with the diplomat. A senior White House official confirmed to NPR's Tamara Keith that Jared Kushner (Trump's son-in-law and a senior White House adviser) also met with Kislyak during the transition, along with Flynn. The official would say only that the meeting lasted about 20 minutes and occurred in December at Trump Tower in New York City. No date was provided. In Russia, Kremlin spokesman Dmitry Peskov said Thursday that it's not unusual for diplomats to meet with legislators, and he suggested that the current situation is too chaotic to evaluate. "We see a highly emotional atmosphere," Peskov said, according to state-run Tass media. "But before making any evaluations, we should wait for everyone to calm down and the situation to stabilize."